I visited Esca last Friday to have lunch and to try Pastry Chef Tracy Obolsky’s fluffernutter budino. While I was there I also tried two other interesting desserts. 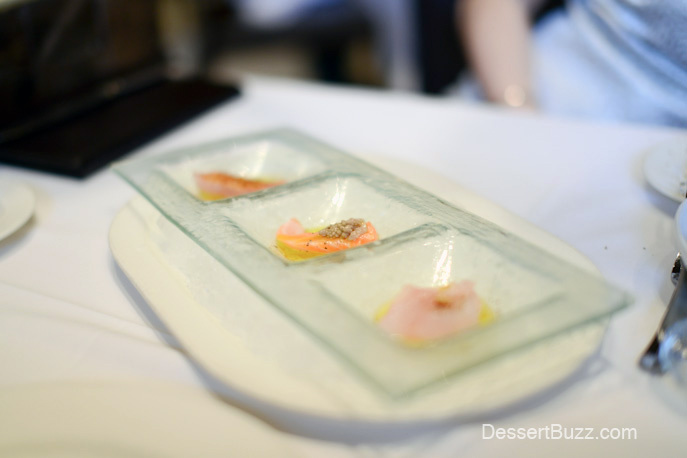 Esca is the perfect place for a dessert tasting since their well known crudo dishes are so light and protein-heavy. The affogato di caffe was like a five-star espresso float from heaven. To me, the focus of this dessert is the contrast between the sweetness of the raw sugar gelato and the bitterness of the expresso. I’m not a coffee drinker but I love this flavor combination. In addition to the creamy base there are bits of brownie and crunchy, Heath-bar-like pieces of salted toffee throughout the and concentrated at the bottom of the glass There are also small shards of raw sugar within the gelato. 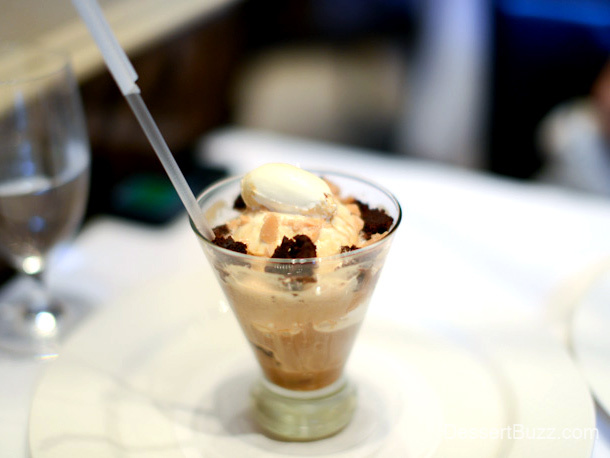 While we were consuming the affogato, Chef David Pasternack stopped by our table to remind us to “make sure we [use the extra-long sundae spoons to] get all the way down to the bottom of the glass”. Obolsky says of Pasternack “he’s always pushing me, suggesting things [ingredients] when he get his hands on something special or unusual” She also says he’s very supportive of her ideas and allows her a lot of freedom. For example, she recently ordered some green gage plums all the way from New Zealand for a special dessert (they’re in season for about 2 weeks a year). I’m not a huge cheesecake fan but the Cioccolate di mascarpone isn’t really a standard cheesecake. The texture is airy and whipped like a chocolate mousse, but the flavor is tangy rather than sweet. 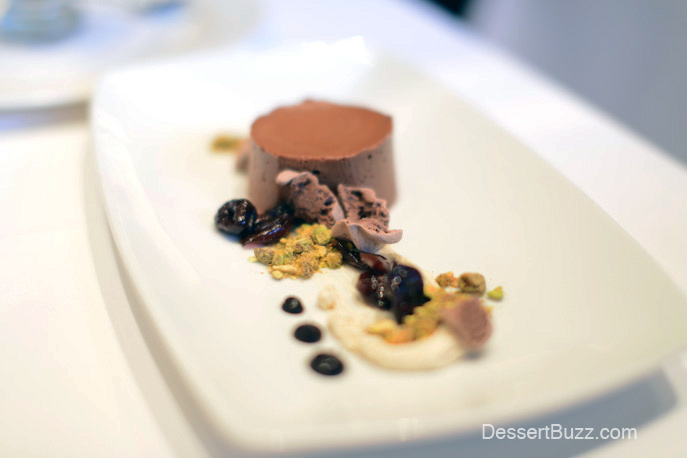 Pistachios, meringue crisps and balsamic cherries add some texture and make for a nice composition on the plate. This dish is light enough to eat even after one of heavier pasta dishes that Esca is also known for. Look for a write-up of fluffernutter budino on Serious Eats New York in the coming weeks. Tracy Obolsky has been with Esca for three years and previously worked at a number of NYC restaurants including Madison and Vine and Cookshop. She is credited with developing Greene Ice Cream which received critical acclaim in the New York Times. I’m sure we’ll be hearing more from Tracy in the years to come. Esca is located at 402 West 43rd Street (off 9th Ave.) Their webiste is here. Follow @dessertbuzz on Twitter. I love the desserts at Esca. Tracy is the best it is no wonder she has been nominated by Food & Wine for Best New Pastry Chef for 2013. I hope she wins. 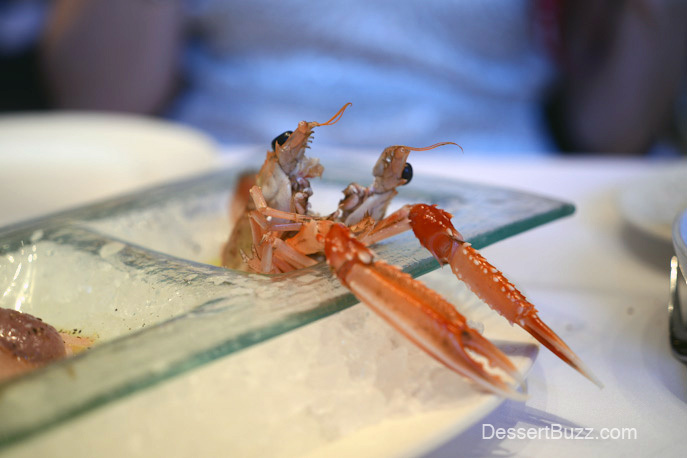 I especially like the Gelati or sorbetti – the combination of flavors are unexpected and leave you wanting more and wondering how in the world the chef came up with the ideas of which flavors to combine. Agreed. Tracy has a real passion for her creations. @Frank–I’ll ask her for the piece!